Build the perfect floor mat that best matches your Camaro - any model, any year, most colors! Select the carpet configuration, logo (all generations), thread color, carpet color, and binding, and we'll build them just for you right here in the USA! Using the latest technology to ensure a perfect fit for every Camaro model, Lloyd Mats provide greater coverage and protection than other OEM mats on the market. Simply follow the 5 easy steps in the CONFIGURATOR to create the custom mats you want. The mats will be built to your specifications and shipped direct from the manufacturer. Please allow 10 to 14 business days for delivery of Customized Floor Mat orders. For Customized Floor Mats Click the CONFIGURE Button Below. 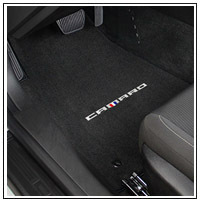 Ultimats™ have the most to offer in custom options for Camaro floor mats. Each mat is custom made from handmade patterns digitally mastered in Lloyd's CAD system to achieve the best coverage and fit possible. Mat colors are specifically designed for the best match and complement to all Camaro interiors. Choose from the largest variety of Camaro logos available. Velourtex™ Mats The Velourtex line of floor mats was created by Lloyd to provide a value priced, high quality automotive floor mat, with the availability of Lloyd’s broad range of trademark, lifestyle and personalized logo options. Starting with a high quality nylon yarn, we’ve created a silky smooth texture similar to late model original equipment mats, but with a heavier more dense carpet face. The multi-layer backing is designed to maintain the mat shape and provide protection for your original carpet. Note: To edit your order or make changes to your mat selections, remove the item from your shopping cart and re-enter your order. Custom Mats are nonreturnable, nonrefundable and nonexchangeable. If you need assistance, contact Customer Service at 1-800-653-1375, Monday-Friday, 8-5 EST.